Xbox One is already home to some amazing single player experiences, but let's face it, it's in multiplayer that gamers truly get to test their mettle. Whether it's getting one over on your mates for those all-important bragging rights in FIFA 14, testing yourself against the best players in the world at Call of Duty Ghosts, or teaming up for brutal co-op gladiatorial encounters in Ryse: Son of Rome, multiplayer is where gamers get to show off their true skills. Xbox One is already offering a range of new features and services that will totally transform your multiplayer experience. Perhaps the most significant is the move to dedicated cloud-based server technology, with over 300,000 servers ready and waiting to serve your every gaming need. Xbox Live has been the destination of choice for gamers for over ten years, but dedicated servers mean your multiplayer experience will be fast, smooth, stable and lag free, essential requirements for true next generation gaming. But you're also going to need someone to play against right - an opponent worthy of your steel? Never fear, as Xbox One's Smart Match has you covered. This advanced new system uses intelligent algorithms to provide the perfect multiplayer match-making experience, pitting you against opponents based on their skill level, language and reputation, a holy trinity which will ensure you'll always find someone appropriate to play against. We've all been stuck watching the screen while matchmaking grinds away seeking out new games and opponents. Well, Xbox One's Snap function allows you to catch up on TV, browse the web or even throw down the gauntlet on social media while you wait, meaning no more queuing blues, as there'll always be something new to do in the background. This should also allow more quirky and off-beat game modes to flourish, as players will be more likely to seek them out, rather than just diving into the most uber popular ones. Reputation is one of the most important components of your online presence and Xbox One's new community powered reputation system is designed to help you avoid people you might not want to play with. A streamlined traffic light-style system of green-yellow-red will allow you to easily identify players' rep and a mix of advanced algorithms and feedback from real gamers ensures that your Xbox Live will be rewarding and most importantly, hassle free. But just like in single-player, it's ultimately the games themselves that really matter and Xbox One's multiplayer is packed with exclusives and first-runs. 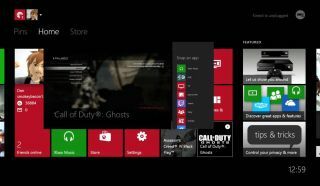 All of Call of Duty: Ghosts' downloadable content (DLC) appears first on Xbox, meaning you get to play all the maps, modes and customisations before anyone else, cementing Xbox's position as the home of COD. FIFA 14's Ultimate Team Legends is also exclusive to Xbox One, allowing to mix and match legendary players from different eras to create your ultimate footy team. How would Gary Lineker have fared if he'd had Pele playing alongside him up front and what if you'd paired them with some of today's modern midfield geniuses like Messi? Ultimate Team Legends will let you find out by creating your ultimate dream footy team. Forza Motorsport 5's new Drivatar also ushers in a new era of competitor AI with your driving style and characteristics being captured by a new digital AI persona. This Drivatar then forms the basis for AI drivers throughout the game, so you'll be playing against opponents who display proper human-style characteristics, rather than soulless AI constructs. It's a bold innovative approach, with adaptive AI ensuring real, meaningful and thrilling driving challenges. Perhaps what's most exciting of all though, is that this is just the beginning of multiplayer on Xbox One and, as it has for the past decade, Xbox Live will continue to change and evolve to offer the most cutting edge experiences. In short, if you want to discover true next generation multiplayer gaming, it's already here on Xbox One and Xbox Live.